Helmut Newcake was the first patisserie offering traditional French cakes and pastries that are 100% gluten free. Helmut Newcake also offers a Sunday brunch (reservation is a must), as well as an Epicerie selling hard-to-find gluten free products. A brilliant bakery offering a wide range of gluten free breads and pastries made with natural gluten substitutes. These pretty sweet treats are a Parisian delicacy and luckily for those on a gluten free diet, (usually) don’t contain gluten! Check out our article to find the best macarons Paris has to offer and enjoy some guilty free macaron munching! Season is a trendy hybrid eatery, falling somewhere between a coffee shop, juice bar and neobistro. Their menu, which changes regularly to fit the season, always incorporates gluten free options for you to enjoy. Their acai bowls are also a gluten free delight to both the eyes and stomach! 1 rue Dupuis, 3rd arrondissement. Open Monday- Saturday 8:30 AM- 1 AM, Sunday 8:30- 7: 30 PM (the kitchen closes at 4:30). The take away café- 8 rue Dupetit Thouars, 3rd arrondissement. Open everyday 8:30 AM- 5 PM. Maison bastille serves homemade fresh and colourful salads and soups, the majority of which are gluten free! This cosy café serves a tasty and original menu which is a 100% gluten free. Their set brunch menu is also definitely worth tasting! They also serve a selection of gluten free products for you to buy for a meal chez vous. One of the coolest addresses on the block serving a menu 100% veggie and gluten free. They have also mastered the art of slick interior design, making it a joy to eat there! There are two Café Pinson addresses in Paris, where you can enjoy homemade gluten free goodies in a stylish setting. You won’t spot gluten anywhere on their menu! You can eat both lunch and dinner here with the full assurance it will be 100% gluten free. Be warned, however, the prices are rather extortionate. They also have a gluten free bakery on site. Eating out with a restricted diet doesn’t have to be expensive. This cantine is cheap and cheerful and always features gluten free options on their menu. Soya serves vegetarian and gluten free options in a former faucet factory near the trendy Canal Saint-Martin district. The all- you-can-eat Sunday brunch for €27 offers hot starters, numerous cold salads and purées and desserts. Reservations are highly recommended. A classy restaurant with an even classier menu and with warning in advance, the young American chef Braden Perkins and his partner Laura Adrian will serve a gluten free tasting menu, slightly adapting their already mainly gf menu. Great news, you can enjoy a delicious traditional French meal which is free from gluten- Crêpes! The traditional Breton crepes are called galettes de sarrasin which are made from 100% buckwheat flour (blè noir or farine de sarrasin). Gone are the aged lace and old school interiors of the traditional crêperie at Krugen- this place is the definition of cool. With slick and modern decor, it’s aesthetically very pleasing, but the crêpes are still great and are filled with quality ingredients straight from Breton. Naturalia and Bio c’Bon are organic grocery store chains in Paris which have a large gluten free range for you to buy substitutes to cook up a treat chez vous. 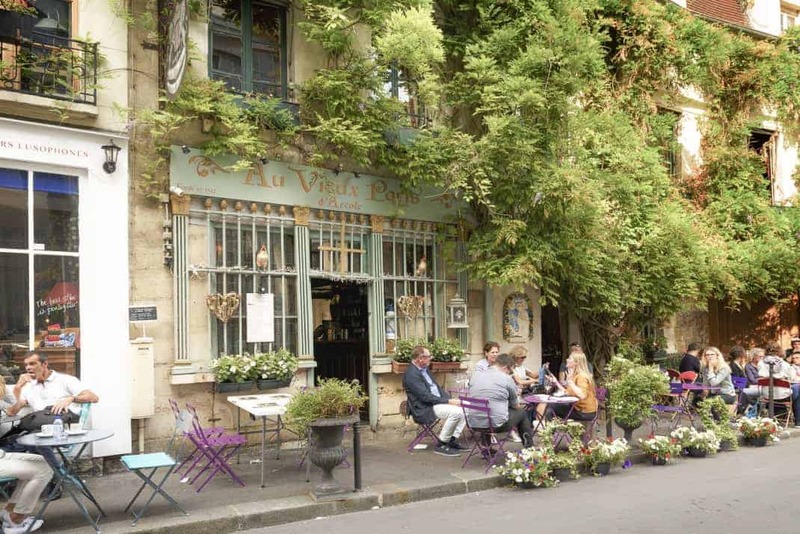 Everything you ever wanted to know about dining, cooking and eating in Paris. Satisfy your late night cravings in Paris at delicious Parisian restaurants, listed in this article right here! What is your favorite French dish? Are you looking for a nice French meal, and wonder where to eat? No matter you’ve been in France, or not, if you visit France, you need to try these dishes! Check this article! We have selected 10 best French dishes that you shouldn’t miss in France! The best crêperies in Paris!